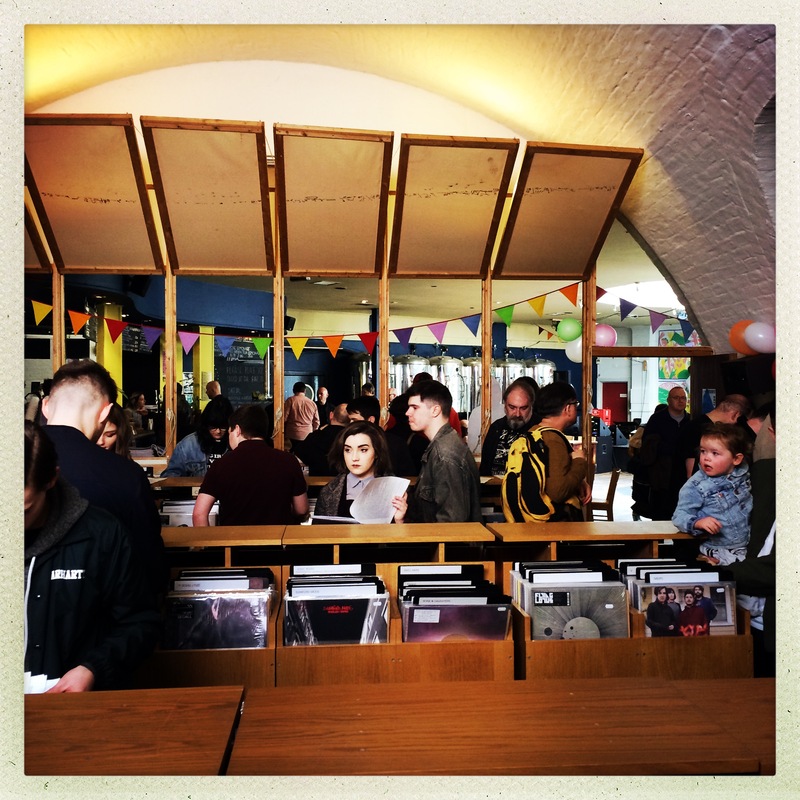 “I knew what I wanted to create,” says monorail’s Stephen McRobbie, a week or so after the record shop celebrated 15 years of trading in Glasgow’s King’s Court. McRobbie had already done that for me and likely legions of others. Summer 1996, first year of university. The Tories were in decline and Belle and Sebastian were on the rise. The west end of Glasgow bristled with heady romance and possibility. Bounding up the stairs to the record store in John Smith’s Bookshop, long since a Starbucks, I felt giddy. McRobbie, known to me and my friend as frontman of The Pastels, was behind the counter. It seemed implausibly glamorous to two kids used to getting records we wanted on order, or scavenged from record fairs. As we scanned the racks, we laughed with disbelief. There was *actual treasure* here. I promptly blew my entire weekend budget on two records: Felt’s Splendour Of Fear and 13 Point Plan To Destroy America by Nation of Ulysses, the coolest band in the world, I had decided, after seeing a picture of them in the Melody Maker. The record shops seemed countless in Glasgow then: Missing, Avalanche, HMV, Virgin, Fopp – and at Tower Records, four whole floors of music and memorabilia. Then, ructions. Though still operating to this day as an academic bookseller, John Smith closed its doors in 2000. The rise of streaming, online shopping and huge names like Borders was merciless. In 2000 there were 700 record stores in the UK; in 2010, under 300. But Record Store Day and the rise of vinyl stemmed the flow, even reversing the decline with new bucks such as LP Records in Glasgow and Assai Records in Edinburgh and Broughty Ferry taking their place among the 340-odd record shops currently operating around the UK. Monorail haven’t surfed a wave. They were there in the tumultuous days of the early 2000s; a time when Edinburgh’s Avalanche indie empire went from having a now unthinkable four stores around the city, to two, to just one. What’s kept them going is a healthy sense of economy, lashings of elbow grease and an active desire to be part of Glasgow’s music scene. “The money that we started monorail with was quite small,” says McRobbie, noting that safeguarding the initial investment from cofounders Dep Downie and David Williamson, the late Matthew Algie boss who also founded Tinderbox – and used to choose their exemplary playlists – was a primary motivation in the shop’s early days. Geographic imprint, Downie worked “crazy hours” as monorail’s only full time employee for almost two years. The shop’s identity was beginning to take shape. No-one in Glasgow was stocking the full Geographic back catalogue, nor that of Chemikal Underground or Rock Action. “We wanted to make them all to feel part of it, and reached out to people like Optimo when we started doing Optimo Album Of The Month,” says McRobbie. “We wanted to create that solidarity with people who loved and made music with things like the monorail cinema club. I had worked in publc libraries before and I’d always liked that idea of helping to make a place where people can come to, that social aspect. “And what I thought was really good about John Smith’s was that there were several niches. It wasn’t like they had tried to do everything, but instead do a few things well. Monorail certainly functions a locus of the city’s music scene. In addition to McRobbie, Michael Kasparis of Night School Records runs the online shop while Eilidh Rodgers, the drumming half of 2017’s SAY Award winners Sacred Paws, has served behind the counter for around seven years. Now with around five full-time staff, monorail, a Living Wage Employer for over two years, has supported Project Ability, a neighbouring organisation using visual arts to support people with disabilities and mental health issues, for more than a decade. “They generally have an annual show in mono where we sell their work, and when the Scottish government brought in the plastic bag tax charge we decided that the money will be took from that would go them,” says McRobbie. Over the coming months Geographic plan releases by Spinning Coin, Strawberry Switchblade and a retrospective of Melody Dog, the early 1990s band formed by Pat Laureate of the Vesuvius label and future-Pastel Katrina Mitchell. The Pastels themselves, says McRobbie, are beginning to write new music for their first release since 2013’s Slow Summits album. For now the shop will continue to grapple with the effect of Brexit on its substantial collection of international releases. “It has had an impact on our business,” he says. “We were beginning to stock a lot more international titles and then all of a sudden the pound wasn’t worth anything and records that were £15 were suddenly £24. McRobbie is pragmatic about the future, however. Maybe it’ll be like the early days of trial and error. While its focus is Glasgow, monorail’s ethos is outward-looking, never insular. And the demand for music from other places is there. Curiosity and openness are prerequisites of magic. Whatever shape the consumption of music takes in the early 2030s, these are folk with faith there will always be new sounds to marvel at. *Photos by Katrina Mitchell. Top image has: Mark Hillier, Dep Downie, Bill, Eilidh Rodgers, Stephen McRobbie, Tara Quinn, Russell Elder. In the early ’90s nadir of vinyl, Austin’s large independent record store Waterloo moved the entire inventory of it to a small storefront next door. The Vinyl Annex felt like a kind of clubhouse for us dead-enders who would not relinquish our turntables. It was a good time for it, in a way. The 7″ single was a lively and cheap format for discovering new bands. And rich folks who had decided that records were passé were selling their fancy phonographs super cheap at yard sales! Nadine, one day I walked into the Vinyl Annex and saw The Nation of Ulysses’ Plays Pretty for Baby with that photo of the band on the cover, in matching suits, mid freak-out, and decided that they looked like they might be the coolest band in the world. I asked the clerk (I think it was Alejandro Escovedo, actually) to put it on for me, I went in one of the two magic listening booths. Hearing a few bars of “N Sub Ulysses” confirmed that they were, in fact, the coolest band in the world. (That was before we got back home and read the mad brilliance of their Teen Beat-meets-Situationist-terrorists liner notes).